It is not easy to feel grief, we avoid it at all costs with distractions galore. Allowing yourself to feel grief and cry and rage and weep are very healing actions to take you forward. Grief that is not felt is invisible and holds you back. Clues that you are not feeling grief is lots of unfounded fear, perhaps you feel numb, anxious. How can you get to a point where you can organically feel grief? Writing, talking to someone you trust, exercise, getting educated on recognizing grief, find a support group, being really good to yourself because you are hurting. Grief work is a very personal journey, there is no timeframe, no right and wrong to process grief and your coping strategy will belong only to you. Only you have to validate this. Is grief work easy, no it is not. It’s uncomfortable, the good news is that every opportunity you have to process and express grief the quicker it goes away. When I was sixteen years old it occurred to me that something was terribly wrong with my family interactions. This was the beginning of my long journey, or should I say my lifelong journey of finding the truth. This journey has been very hard at times but the more truth that was uncovered the healthier and happier I became. Finding the truth unveiled lots of information that helped me understand the dysfunctional dynamics that were going on and where I was placed within that strange puzzle. I am still unraveling the trauma all these years later. And I am not at all disturbed by this. As hard as it is to know the sick truths of the horrible treatment I incurred, I will never stop looking for the truth. On the bright side, the more I know about me the more I know about others. The side effect of finding the truth of human behavior is the ability to know others and that is priceless. 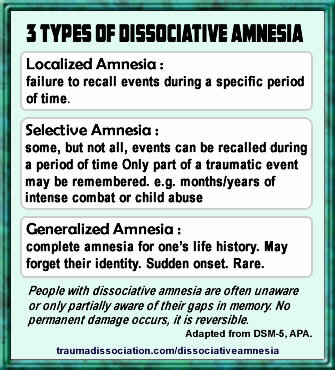 Here are bits and pieces of an article about Dissociative Amnesia from the blog: TraumaDissociation.com. It Makes Sense We Sabotage Ourselves and Why It’s OK.
Self sabotage comes in many forms. We can become hyper aware because we have been dealing with unreliable people for a long time and we expect things to go wrong. We can get in the habit of not making commitments because those we trusted thwarted all that we loved. We may want to be unseen because any attention means possible abuse. We may people please to keep us safe at the expense of our own needs. We may want to control everything just to feel safe enough to exist. There are many more ways to self sabotage but the reason why we do that is because there are unresolved issues just under the surface of our awareness and our self sabotage keeps us distracted enough not to feel those feelings. Self sabotage is a coping method and that is OK until you are in a place to look at those feelings and release them. It’s not easy but with some kindness and compassion for yourself you will gradually let go of self sabotaging behavior. One of the worst experiences one can have is to be betrayed. What is betrayal? It’s disloyalty, stabbed in the back, unfaithful, double crossed, tricked, given false information, or no information, misled, abandoned, let down, and deserted. You get the idea. It’s that crushing feeling of shock, disbelief, anger, shame, and you want retribution and fight hard against denial of the betrayal because it hurts so much. This is no easy feeling to deal with, it may take some time to process what is going on. Here are some suggestions. Talk it out with a trusted friend. Feel the emptiness and grieve. Be really good to yourself. The key to healing betrayal is to be self-aware and really good to yourself. Know that it is only a matter of time before you feel better. Resistance is something I live with every day. It’s like a chronic illness. For me resistance keeps me from doing the things that I really want to do. The things I know are really good for me. I have created an inner barrier that sabotages my own efforts. Why does this happen? There are many reasons all of us live with resistance here are a few. Fear, maybe be don’t want to know the truth or are fearful of become uncomfortable with self-knowledge. Fear of the unknown, not realizing the need for a change, maintaining an old habit. Those are just a few reasons. Resistance is part of the human condition. No one really likes change or makes changes quickly. Rather, resistance to change can disappear in a very natural way. Examining ourselves is a deep way will cause change to happen painlessly, automatically, organically. Uncovering, unblending, undoing what we have always done is the catalyst for positive, dramatic change in tiny steps. Take the time to objectively look at your own beliefs and actions. Why are you believing those beliefs, why are you taking those actions. Are these beliefs learned somewhere along your life or are they your own? Are the actions you are taking in your comfort zone, why? Ask these questions in a non judgmental way so your inner life trusts you to reveal the information you need. Examining resistance is a life long self-care action. You are meant to progress not stand still.